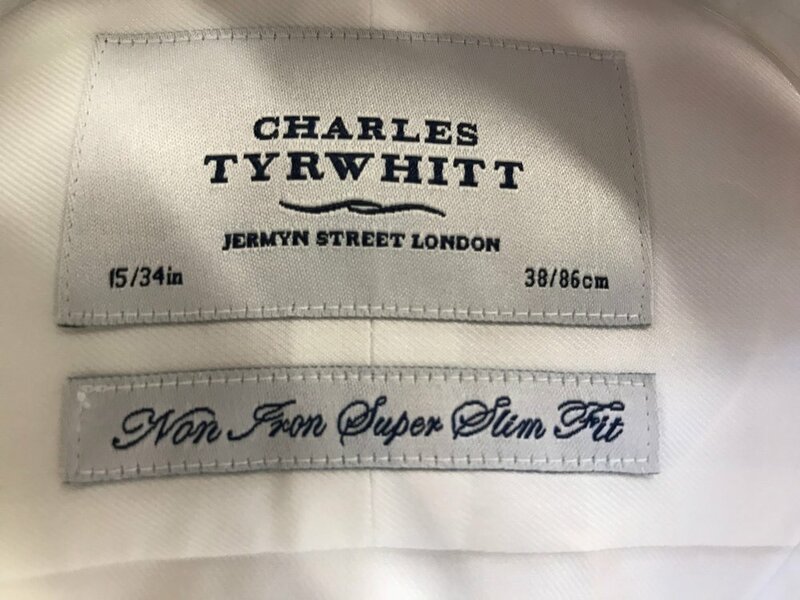 Charles Tyrwhitt, the difficult to spell but much beloved and go-to shirt company for many men, recently released a new fit for their dress shirts: the Super Slim Fit. While they have long offered Classic, Slim, and Extra Slim Fit shirts, some customers were still left wanting in that none of these fits were quite slim enough for them. The new fit is supposed to be the perfect shirt for anyone who thinks that the Extra Slim shirts are still a bit too loose. I, being a rather slim guy myself, was rather excited to hear about the new Super Slim dress shirts and, of course, took the opportunity to order one and give it a try. This new fit of dress shirt is still brand new for Charles Tyrwhitt, so they only offer 4 options in the new Super Slim Fit: Two whites, and two blues, with different kinds of fabrics. I ordered the white twill for this review. They promise more options are coming in the future, which will be nice not just for multiple fabric and color options, but for collar styles as well. Who knows? Maybe this fit will even make it into their Business Casual and Casual lines as well. As always when discussing Charles Tyrwhitt, wait for a coupon/sale before you buy. You should never pay more than about $33 for a dress shirt from them. This link will get you their dress shirts for $33 (as of post time) in addition to free shipping on any order, no minimum. As you can see right off the bat, there is a considerable difference between the Extra Slim Fit shirt and the new Super Slim Fit shirt. Most noticeable is the waist and armhole measurements, which are both a full inch slimmer in the Super Slim than in the Extra Slim. (Remember, all measurements are doubled since when the shirt is laying flat you only measure one side. Thus, a difference in the chart of a half-inch is really a full inch in the actual garment. The one exception to this is the wrist measurement, which is opened up for the measurement and is thus not doubled.) What this means, primarily, is that if the Extra Slim shirts used to be too baggy for you in the sleeve, or bunched up too much around your waist when tucked in, these new Super Slim shirts should absolutely solve these problems. These things are slim. Charles Tyrwhitt is really trying to cater to slimmer guys here. When they say "Super Slim," they mean Super Slim. And honestly, kudos to them for that! That all being said, if the Extra Slim was close, but just a tiny bit too loose on you, these new Super Slim shirts are going to be too slim for you. These shirts are not just a tiny bit slimmer. The change in fit is significant, and most noticeable in the raised and smaller armholes. If you're not very slim, these will cut into your underarms and be uncomfortable. Additionally, the buttons/placket will pucker from being too tight. As you can see, for me personally (at 6'1 tall and 160 lbs. ), both fits work pretty well. The Super Slim is a bit too tight in the waist, and at certain angles will cause puckering in the placket, but it looks cleaner tucked in and in the sleeves. The Extra Slim has a bit too much room in the waist and chest, but not to the point of it being worth having it altered. The wrist is a bit too wide on both fits. I especially liked that CT did not alter the length of the shirt for the Super Slim fit one bit. Many brands assume that if you're skinny, you're shorter. This is, of course, not at all necessarily the case. I ordered my usual 15/34 with them, and the length on the Super Slim was perfectly just as long as the old Extra Slim. Finally, I should also point out that I really appreciate that they otherwise kept the proportions the same as all their other shirts. They did not put some tiny collar or placket on this new fit, as so many other manufacturers or very slim shirts do. It's the same (semi-?) spread collar you find on their other shirts. Bottom line: This is a shirt designed to bring the exact same styles available in the other CT fits to guys that are very slim. The model here really seems to be: "Make the same great shirt, just slimmer," something that just about no other company right now seems to be capable of. If you're very slim, rejoice — this shirt is going to fit you. If you were happy enough with the Extra Slim, though, this new fit is likely going to be too tight, and you should just stick with what you like now. There is not a tremendous amount to say here: the quality and construction of the new Super Slim shirts is the same thing you'd expect from all CT shirts. It's respectable, by no means cheap, but is also not top-of-the-line. The non-iron is pretty solid and will definitely save you some time. As always, if you're looking for great looking, and great fitting shirts — with now even more options for more guy body types! — at great prices, look no further than Charles Tyrwhitt. You really cannot go wrong with these guys. Guys that care about how their clothing fits have long been used to complaining about things being way too baggy, or fitting to loosely. It's rather rare to say that something is cut too slim for many guys, but Charles Tyrwhitt is here, hopefully, moving the industry in the right direction of providing fit options on both sides of "average."